This vanity has both an all-around look and a traditional style. This piece comes with a beautiful brown solid wood base and a white marble counter. Make your bathroom look like new with this good-looking, useful set from Wyndham Collection. You will need Adobe Acrobat Reader to view PDF documents. Use this vanity to bring more traditional style into your bathroom. Made with a special brown solid wood base and a white marble counter, this piece will make your bathroom look even nicer. Add a classic feel to your bathroom with this simple vanity set from Wyndham Collection. This vanity has both an all-around look and a traditional style. Made with a special brown solid wood base and a white marble counter, this piece will make your bathroom look even nicer. Put a nice twist on your bathroom project with this classic piece from Wyndham Collection. For a bit of traditional style in your bathroom, choose this beautiful vanity. Its comes with a nice white marble counter and brown solid wood base for strength and style. Bring a classic look and feel to your bathroom with this beautiful set from Wyndham Collection. Designed with a traditional style and strong build, this vanity is a perfect choice for any bathroom. The good-looking white marble counter and brown solid wood base make a big difference in your bathroom. Redo the style of your bathroom with this classic from Wyndham Collection. Hatton 60-inch W 3-Drawer 4-Door Vanity in Brown With Marble Top in White, Double Basins This vanity has both an all-around look and a traditional style. This piece comes with a beautiful brown solid wood base and a white marble counter. Make your bathroom look like new with this good-looking, useful set from Wyndham Collection. 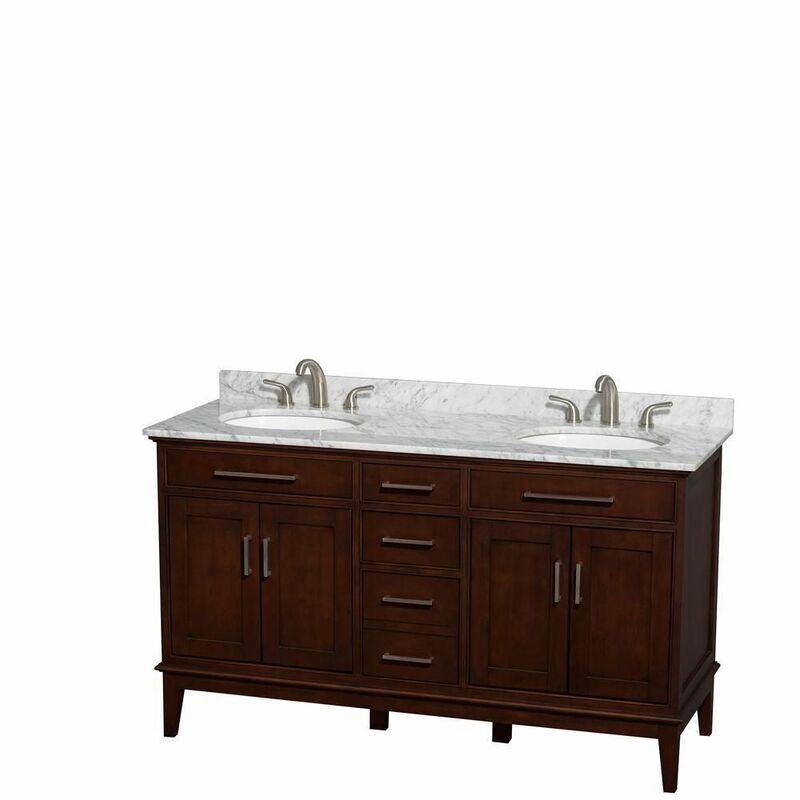 Hatton 60-inch W 3-Drawer 4-Door Vanity in Brown With Marble Top in White, Double Basins is rated 4.3 out of 5 by 3. Rated 5 out of 5 by donna from This cabinet both the 59" and 49" are stunning. I took them out of the box and it was just absolu... This cabinet both the 59" and 49" are stunning. I took them out of the box and it was just absolutely gorgeous. I cannot wait to install. Well worth the price. I would recommend it highly. Rated 5 out of 5 by HomeDepotCustomer from Cabinet is very nice. Very nicely built cabinet. Strong and stable and very nice color. Rated 3 out of 5 by Laura from Beautiful with problems This is a beautiful vanity with a beautiful top. As a pro, I have installed many vanity sets. There is often damage when they arrive. It's just something we anticipate, scratches, cracks, usually minor, but the beauty and value can't be beat. This vanity, however required more modification than usual. The marble top did not fit in the top of the vanity. This top has square sinks and has a wider sink base. We removed triangular blocks of wood in the inside front corners and it still would not seat into the top of the vanity. We had to bevel the inside edges of the ends to accommodate the sinks underneath. Whew! That worked and the top finally fit, nesting snugly to the top of the vanity. This is not a common issue. It is not something that most installers or DIYers could manage. It took 3 people to maneuver the top in and out multiple times to resolve this. We are still happy with the results.